Scientists have discovered a previously unknown virus living in the human gut, according to a study in Nature Communications. Exploring genetic material found in intestinal samples, the international team uncovered the CrAssphage virus. They say the virus could influence the behaviour of some of the most common bacteria in our gut. Experts say these types of viruses, called bacteriophages, have been shown to play a role in chronic diseases. Led by a team at San Diego State University in the USA, scientists scoured genetic information stored in three large international databases. They stumbled upon a piece of DNA, some 100,000 letters long, present in more than half of all samples from the gut. And while cross-checking its identity in global directories they realised it had never been described before. Prof Robert Edwards, lead author, said: "It is not unusual to go looking for a novel virus and find one. "But it's very unusual to find one that so many people have in common. "The fact it has flown under the radar for so long is very strange." 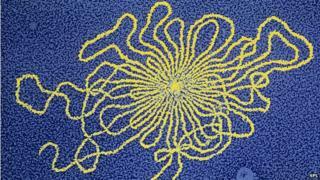 Researchers say the virus has the genetic fingerprint of a bacteriophage - a type of virus known to infect bacteria. Phages may work to control the behaviour of bacteria they infect - some make it easier for bacteria to inhabit in their environments while others allow bacteria to become more potent. Dr Edwards said: "In some way phages are like wolves in the wild, surrounded by hares and deer. "They are critical components of our gut ecosystems, helping control the growth of bacterial populations and allowing a diversity of species." According to the team, CrAssphage infects one of the most common types of bacteria in our guts. They are now trying to grow the virus in a laboratory. And they say the next step would be to work out exactly how the virus affects our gut bacteria. Dr Martha Clokie, at the University of Leicester, who was not involved in the research, told the BBC: "What is exciting here is the scientists have produced new techniques and powerful tools to help identify previously unknown viruses. "And thinking longer term, we know bacteria can play an important role in chronic diseases such as obesity and diabetes. "If we can pin down these viral controllers, we could perhaps one day use them to modify any harmful bacteria, rendering them less powerful."